Two toy Citroens from the 1960s/1970s. Both Citroens have the exposed headlamps, which makes me think that they are loosely based on the Citroen ID 19, or the early DS 19. 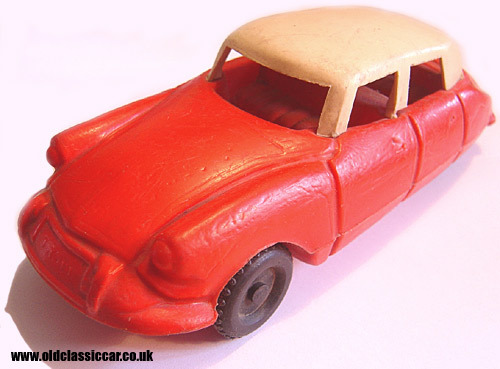 The red car, measuring approximately 7.5ins in length, is a lightweight and fairly crude plastic moulded toy, with the roof being a separate piece of cream plastic, simply clipped into place. There is no maker's name visible, unless the registration number OM II means anything? Although not in the best condition, it caught my eye a few years ago simply because it must be quite rare now, even in this well-played-with condition. The green Citroen DS/ID was made in West Germany, and measures 4ins in length. 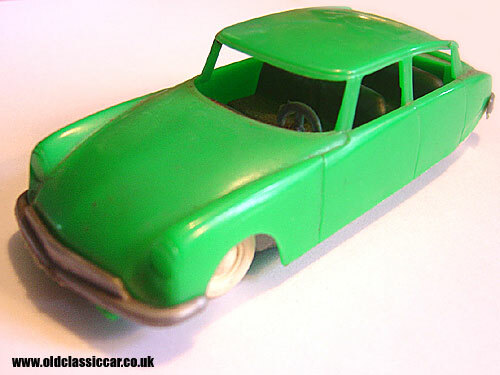 The green bodyshell and silver coloured base are separate items, clipped together underneath. 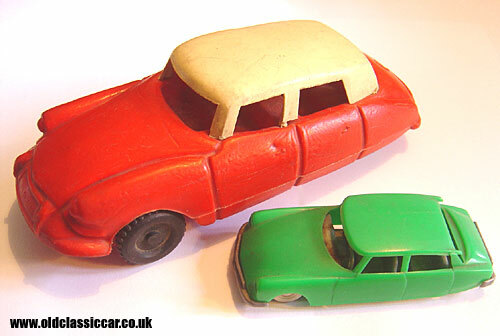 Whereas the red car is made from a flexible plastic, and can take some abuse from excited children, the green car is made from a very brittle plastic, and would easily have broken if subjected to some energetic playing with. Does anyone recognise the maker of either of these toy Citroens?